Roll of honour: The Chief Minister honoured Israeli architect Moshe Safdie on the occasion. 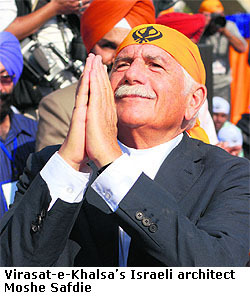 He said Safdie had studied Sikh religion for two years before designing the heritage museum. Safdie said he wanted the museum to look 300 years old and he thought he had succeeded in this objective. Others who were honoured included noted filmmaker Bobby Bedi and designer Amar Behl for creating the exhibits of the heritage museum. The Akalis today basked in the reflected glory of the steel petal roof of the Virasat-e-Khalsa that was dedicated to humanity in a ceremony that encompassed all faiths, but was essentially rooted in Sikh culture and tradition. 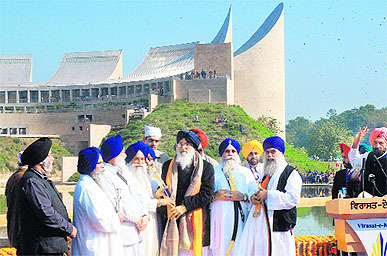 Badal, flanked by Akal Takth Jathedar Gurbachan Singh and the Sikh high priests, pressed a button to unveil the museum’s inaugural plaque as the Virasat-e-Khalsa monument seemingly rose out of the hillocks in the background. Nihangs astride horses and on foot along with ‘gatka’ troupes dressed in blue with saffron colour turbans dotted the hillocks and enhanced the backdrop. Asha Bhosle started the function with a soulful rendition of the ‘shabad’ ‘Mera Sahib, Mera Sahib’ followed by Punjabi singer Jaspinder Narula’s ‘Deh Shiva Var Mohe’. The programme ended with an ‘ardas’ by Takth Sri Keshgarh Sahib Jathedar Giani Tarlochan Singh. A glider then showered confetti and flower petals on the assembled congregation that had BJP president Nitin Gadkari, Art of Living founder Sri Sri Ravi Shankar and Deputy Chief Minister Sukhbir Singh Badal among others. This was followed by a fireworks display. The inauguration clearly belonged to Chief Minister Parkash Singh Badal. The veteran leader has achieved the unique distinction of being behind the creation of the Rs 300 crore monument destined to take the Sikh religious experience to a new level. Rajya Sabha MP Tarlochan Singh set the tone for the function by reminding the congregation that the museum was the result of one man’s dream. With elections in mind, he prayed to the lord to give Badal more time to complete all remaining tasks of the Sikh community. The Chief Minister recollected his chance visit to the Holocaust Museum in Jerusalem and a meeting with its Boston-based Israeli architect Moshe Safdie. 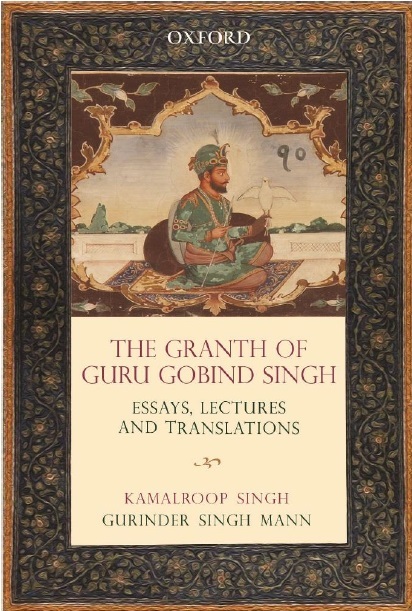 Calling the museum a culmination of his life tasks, Badal said, “I am satisfied that I have managed to fulfill the tasks set for me by the Guru. The Virasat-e-Khalsa stands at a site that is the birthplace of the Khalsa Panth. The second holiest Sikh shrine, Takht Keshgarh Sahib, is located here. It was here in 1699, on the day of Baisakhi, that 10th Sikh master Guru Gobind Singh founded the Khalsa Panth and baptised the 'Panj Piaras'. Conceived as a repository of the rich heritage of the Khalsa, showcasing the history and culture of Punjab, the heritage complex has been built on a 100-acre site to emphasise the eternal message of the Sikh gurus. The Chief Minister said that a never-before miracle in Sikh history would take place in the coming week — the inauguration of three more memorials to commemorate the two genocides that occurred in Sikh history and the victory of Sirhind by Banda Singh Bahadur. Earlier, BJP president Nitin Gadkari said he had been in the construction business for long, but was impressed by the scale of the monument. Spiritual guru Sri Sri Ravi Shankar said today’s ‘sankriti’ had been saved by the Khalsa Panth and that the 120-crore people of the country would be indebted to the Sikh Panth for the sacrifices made by its gurus in the cause of humanity. Also present were Swami Madhav Ashram Shankra-charya Bapu Asa Ram, Pakistani dignitaries Imran Masood (ex-education minister) and Rai Azizullah (ex-MP), former Canadian MPs Ruby Dhalla and Gurbax Malhi, besides Deputy Chief Minister Sukhbir Badal and other senior SAD and BJP leaders.